Climb into a universe of epic proportions. Disclaimer: Worldspanner kindly provided me with a review copy of Duel of Ages II. So, I wasn’t sure what to expect when I gathered three friends around a table to play Duel of Ages II. Was there a great game in amongst this avalanche of cardboard, or was it all just some sprawling shambles stuck in the era of paper-and-counter wargaming? To be honest, things got off to a somewhat rocky start. There was the fiddly setup, complicated by the process of working out which rules to use and which to put aside. DoAII is a sandbox, and there are a plethora of choices to be made about what kind of game you want to play. There are elements you can use or ignore, multiple methods for setting up the map tiles (called ‘platters’), different ways to select characters and to determine the victor. All this seemed a bit unnecessarily complicated, and we didn’t have the patience to go through the instructional scenarios. The first scenario is melee-only, the second ranged-only, and so on; most experienced gamers wouldn’t bother with them. As a rule I’m not a fan of scenario-based instruction and I think this kind of hand-holding is best left to video games. Give me the rules, let me read them, and let me get right into the game. Team White: Cayriss the saurian, Stephen Decatur the swashbuckler, Suva of Orian the honorable alien, Ironhead Mcray the boxer, Sgt. Gritt the sarge, Martians (little green men), Victoria the daredevil, and Bruno Brincelli the muscle. Team Black: Syriach of the warrior race, Pvt. Sanchez the sniper, Boris Andronov the mercenary, Spartacus the gladiator, Venya 8 the android agent, Devon Regal the raider, Annie Oakley the trick shot, and Ardin Glynn the envoy. This bizarre agglomeration of themes reminds me a bit of Heroscape; in that game you also have characters from a wide range of genres and historical periods coming together in free-ranging conflict. In DoAII, this is all justified by a bit of background fluff about a holographic future game which has more than a whiff of Star Trek: The Next Generation about it; but it’s really just an excuse for a Brobdingnagian beat-‘em-up in which everything including the kitchen sink gets thrown into the ring. And therein lies the game’s charm—and its humour. Thankfully, DoAII knows the whole thing is ridiculous and refuses to take itself seriously, and so neither do you. This is playtime, and everyone’s invited. When you get down to it, however, the mechanics are actually remarkably simple. Just about everything is resolved with a ‘challenge’. This consists of comparing an attacker’s stat and a defender’s stat—in melee combat, for example, the attacker’s Melee versus the defender’s React—and determining which is higher and by how much. 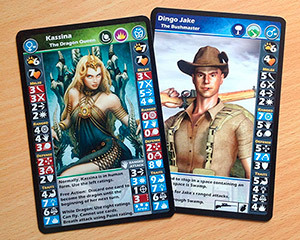 You then draw a Challenge card and consult the appropriate section: Attacker is Higher or Defender is Higher. For a combat check, you’ll discover if the attack was a hit or a miss, and on the former, a further stat comparison and card check informs you how effective the damage was. For an adventure challenge—for example, raiding a room in the other’s team’s base, or trying to get in through their gates—you use the same system, but consult a list of icons that give you results from ‘FOPP’ (Failure of Painful Proportions) to ‘Amaze’. It’s a simple, adaptable system complicated further by various specific modifiers, and it works well—though I must admit the continual card drawing can get slightly bothersome and there does seem to be something slightly more psychologically difficult about accepting a run of bad luck with card draws than the same run of bad luck with dice rolls. Perhaps it’s because you begin to suspect that the balance of odds is against you, whereas you can’t realistically suspect the same of an impartial dice roll. In any case, if one prefers the Gods of Dice, there are simple rules for adapting the system to trust to them instead of cards. 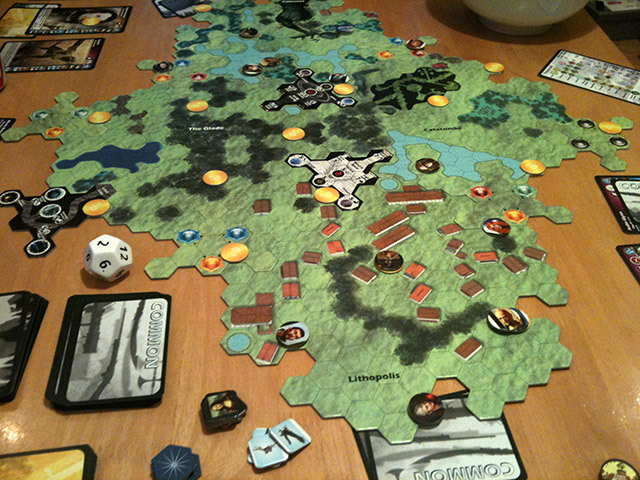 Our characters quickly fanned out into the landscape, heading for the Encounter tokens that peppered the map. When these are revealed, if the indicated stat is high enough, you can make a card draw and hopefully get yourself a useful bit of kit to aid you in the coming battles. It wasn’t long before Spartacus found himself with a Kentucky rifle and a few Molotov cocktails, the swashbuckler was packing a .357 Magnum and an alien device called a Charm Cube, and Annie Oakley had managed to equip herself in period-accurate style with a Model 1903 rifle and a Whitney .36 pistol (and in less period-accurate style with something nasty called a Gemini Sentinel defense platform). Knots of combat began to form across the map—along with a healthy dose of sniper fire and running and screaming—but it isn’t just about killing the other guys. Each team has a base that can be infiltrated, and this is where adventure challenges enter the game. In essence they’re just like combats, but characters use other traits like Wits, Strength and Intellect in order to get through the gates of the other team’s base, raid their armoury, break out prisoners and destroy their locations. You can of course enter your own base, where you can interrogate captured prisoners, heal, get items from your own armoury, and even repair any damage your opponents may have caused. But wait—there’s more! (Not a free set of steak knives, though I’m sure there’s a card for that in there somewhere.) There are other strange things your characters can do to achieve victory. A mysterious character called Lith, rather perfunctorily described as the ‘virtual mother of the Challenges’, has her own cavern lair to which you can bring tribute; from a few strips of bacon to the Mona Lisa. Yes, I realise we’re getting weird now. As are the locations in her lair, which have their own special adventure challenge results. Then there are the labyrinths, mysterious caverns where your characters can resolve age-based adventures and fend off guardians to win your team extra advantages. If it sounds like an crazy grab-bag of stuff, that’s because it is. Duel of Ages II is a delirious rollercoaster ride that doesn’t try to be ‘realistic’ thematically. The theme is a loose excuse for genre-spanning mayhem. But despite the random underpinnings there is room for strategy here, if you manage to keep a certain amount of luck on your side. I should mention what I think could definitely benefit from improvement if there’s ever a Duel of Ages III—the art and design direction. The illustration is a very mixed bag; there are some lovely, professional character portraits in there, but there’s also a metric tonne worth of bad Poser art. Poser is a software program, first released in the late 90s, that allows beginners to make 3D character art. It was a revolutionary program in its day, but it’s since bounced from publisher to publisher, dragging an entire industry of third party 3D figures, clothes and objects along in its wake. It’s terribly disappointing to go through the character cards and flip from professional illustration on one card to glassy-eyed, poorly rendered generic mannequin on the next, and the art on the item cards is uniformly this kind of 3D work. Obviously there are so many illustrations required that the cost to have everything created by a professional would be prohibitive, but let’s hope the game is so successful they can afford to completely revamp some of the art for the next version. The terrain art could be much improved too; in fact the platters looks somewhat like the maps I drew with felt pens on hex paper for a Gamma World roleplaying campaign back in, oh, about 1979—and while serviceable, this can affect usability. Other design offenders are some old-fashioned 70s fonts, clunky Photoshop collages, and some inexpert layout work. It’s a shame, for while I’m sure the publisher is more interested in the game than the visuals, it could be putting off some people who might otherwise buy and enjoy the game. As someone obsessed with high quality visual design, it did put me off until recently, and I was missing out as a result. Still, you do get used to the somewhat dated visuals, and they even become part of the game’s charm after a while. And more charitably, it kind of goes with the ‘throw in the kitchen sink’ feel. So after the alien had chucked his last African throwing spear, Annie Oakley had been overrun by Martians (even her automated defense platform didn’t save her), and Ardin the envoy had brought Spartacus back to life by placing him in an Emergency Body Doc, the smoke finally cleared, we counted up our achievements and Team White was the winner on the day. By a surprisingly small margin actually, because even though they’d had more combat successes, we’d taken the opportunity to infiltrate their base and cause a bit of mayhem. And this is where some of the aforementioned strategy comes in, because even if you’re outmanned and outgunned (or outspeared, outknived, or outpunched), in all but the most basic scenarios there are plenty of other ways to win points and pull a victory out of the proverbial hat. DoAII is really more of a hobby than a boardgame. Like a miniatures game, it offers myriad different options for setup, scenario election, map building, game length—you name it. The Master Compendium is a PDF document that can be downloaded from the Worldspanner website (it would have been good to get this rulebook in the core set, but this way I imagine it can be continually updated and improved) and details 24 missions. The Core Set has a bucketload of characters, items and maps that could last you a lifetime of gaming, but once you throw in the heavy box that is the Master Set, you have enough variety to last several. Whether it’s variety for the sake of variety is something I could only tell after many, many more games, but given that’s the fundamental nature of the game, I don’t think so. It just makes proceedings even more fun. The game designer, Brett Murrell, wrote to me after I’d posted my rules summary to mention that he considered my comment ‘it really is something unique’ to be the highest compliment. I think that says a lot about the kind of game DoAII is, and what its author wants it to be. He’s not interested in making just another boardgame. This is a love letter to the games he played as a kid, and since we’re probably about the same vintage, some of the ones I grew up with too—cardboard counters on a hex map, fun, crazy, imagination-fuelled, sprawling epics. Good times. So to answer the question I asked at the start of this review: great game or sprawling shambles? Both—and that’s exactly why there’s so much enjoyment to be had from Duel of Ages II. I’ve updated my Duel of Ages II Rules Summary & Reference to v1.1 after some player feedback and corrections. You can grab it by clicking the link below.